The Thanksgiving FestivalÂ in Milpitas is now over. When the 2-day and 3-day sections were merged, the total turnout was quite respectable: 17 in the Master-Expert section, 23 each in the A/B and C/D sections. And that’s not even counting all the kids who were there for the one-day Swiss on Friday. Salman Azhar must be very happy with the number of players. The only problem, as I said in my last entry, was the small number of adult players. In the Master-Expert section we had two very distinct groups of players. We had four adults who were actually masters or experts and 13 kids who were not. (Actually, that’s not quite correct. One kid is an expert; the other 12 were classÂ A and B.) I’m pleased to report that in the intergenerational warfare, the older generation completely dominated the youngsters, with 10 wins and one draw in 11 games. I’m the one who gave up the draw, against a 14-year-old named Brian Wai.Â Michael Aigner, his coach, tells me that Brian has never beaten a player rated over 2000, but I very nearly became his first victim. The overall standings also went very true to form. Roberto de Guzman, who at 2400+ was by far the highest-rated, finished first with a clean 6-0 score. (That includes one full-point bye.) Michael Aigner, the second highest-rated at 2200+, was clear second with 4Â½-1Â½. And then there was a five-way tie for the under-2200 prize at 3Â½-2Â½. I was part of the five-way tie, and I won a modest $72 prize. This kept alive my streak — I have now finished in the money in my last four consecutive tournaments. I was satisfied with all of my games except the loss to Aigner, in which I played very poorly. I lost to de Guzman too, but that game will be a good lesson. I won an excellent game in round 5 that I will show you after I’ve had a chance to go over it, and also I won in round 3 with one of my favorite opening traps. I’ll probably do a ChessLecture about that one, so I won’t write about it here. It was interesting to play four games in one tournament against players who were under 15 years old. It’s probably the first time that has happened since I was 15 years old myself! I noticed a pattern, which I think is consistent with Elizabeth Vicary’s comments on scholatic chess that I mentioned in my last entry. Young players, I noticed, tend to be very materialistic. When you give them a chance to win material, they’ll take it. That happened in all four games. I think there may be a couple of reasons for the materialism of young players. First, young people are more innocent, and older people are more suspicious. The young player takes the pawn and doesn’t worry about what will happen next. 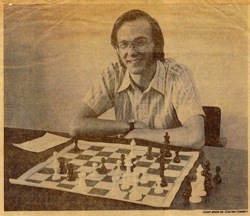 The old player sees that he can take a pawn and wonders what kind of trap his opponent has set. Second, I can remember that when I was younger, it was very hard for me to resist the urge to “cash in” on my advantage by winning material. At that age, you tend to think, “I must win material now, because I might not get the chance to win it again.” In reality it’s quite often the reverse. If you have outplayed your opponent to the point where you can win a pawn, often if you continue to put on the pressure — to “massage” the position, as Jesse Kraai says — you will end up winning even more material. But “massaging” a position is something that you really learn only by experience. The name is Ricardo DeGuzman. And the last game ended drawn, meaning you only tied with three others ($90 each).